Castro, Attorney Michael Bernard ( brother of white house social secretary Jeremy Bernard) , police officers, judges, attorneys, sheriffs, police chiefs and City/County officials. real-estate broker Debra Austin after conversations with HUD Asst. Deputy Secretary Lourdes Castro Ramirez. MILLIONS of Military Personnel and First Responders at risk. barring entry into City Hall and public meetings to silence reports of the illegal cover-up. enough in exposing the corruption infecting our local government, our police department and our Courts. conceal the ongoing illegal cover-up. 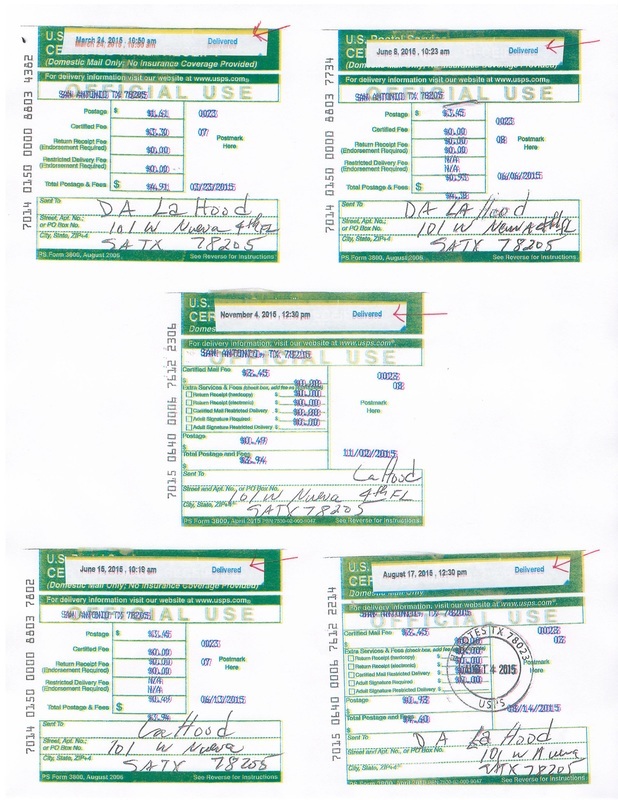 fraudulently obtain what is estimated at $170,000-$200,000 during an approximate time frame of 2002-2005. Nico LaHood lies and conceals evidence in an effort to hide an ongoing RICO-like criminal conspiracy . Mayor / future HUD Secretary Julian Castro, SAPD Chief William McManus, city attorney Michael Bernard ( brother of White House Social Secretary Jeremy Bernard) , City Manager Sheryl Sculley, the City Council and others banned the law-abiding City's former Telecommunications Manager / whistle-blower from City Hall and public meetings in violation of the US Constitution, the Texas Open Meeting Act and other laws in an effort to silence reports of massive, long-term public / police corruption and other crimes. They refused to provide a reason, due process or time limit for the illegal, unconstitutional ban. 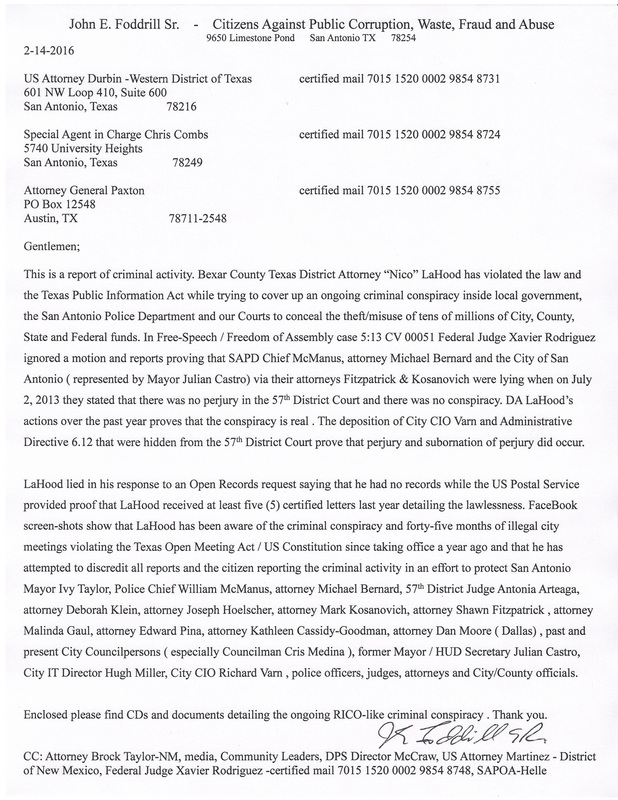 The illegal, unconstitutional ban lasted from July 2009 to April 2013- almost four years during which time Castro and other corrupt officials held illegal meetings in violation of the law.......Bexar County DA Nico LaHood conceals evidence and REFUSEs to enforce the TOMA and other laws in an effort to protect his friends inside City Hall, SAPD, BCSO, AACOG and our Courts. 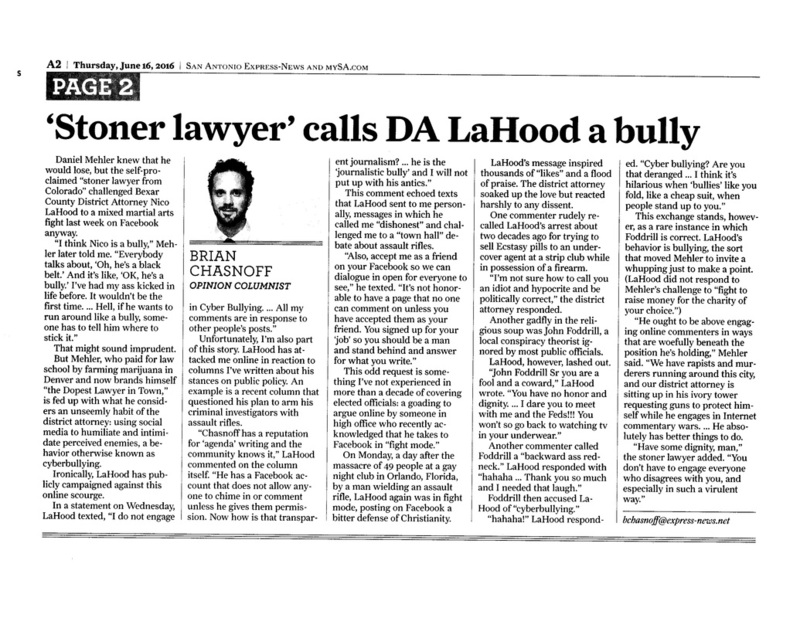 On June 16, 2016 SA Express News reporter Brian Chasnoff published an article detailing the cyber-bullying by DA LaHood targeting whistle-blowers reporting criminal activity including the 4 years of illegal meetings Julian Castro participated in when citizens were banned to silence their reports of corruption from July 2009 to April 2013. 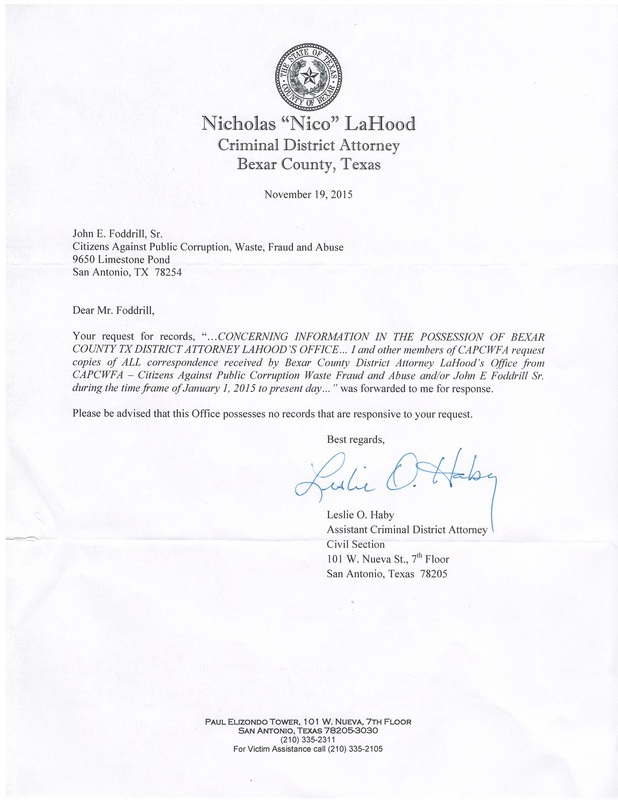 On November 19, 2015 DA LaHood responded to an Open records Request asking for ALL correspondence from CAPCWFA and/or John E Foddrill Sr stating that his office had NO documents/records...a LIE. 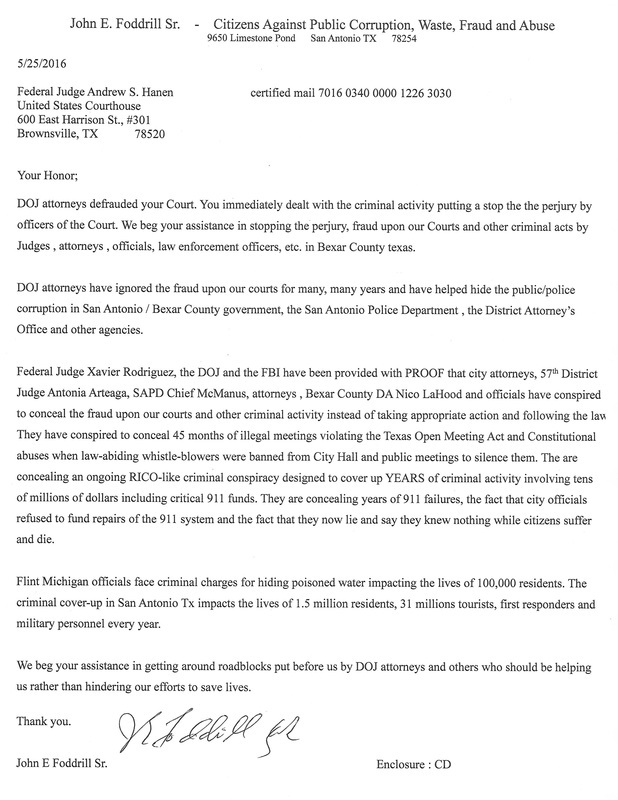 The US Postal Service provided proof that DA LaHood's Office received at least five certified letters in 2015 that citizens had sent along with CDs of information detailing the ongoing criminal conspiracy that LaHood is hiding in an effort to protect his friends including HUD Secretary Julian Castro, attorney Michael Bernard ( brother of White House Social Secretary Jeremy Bernard), SAPD Chief William McManus , City Manager Sheryl Sculley and others. 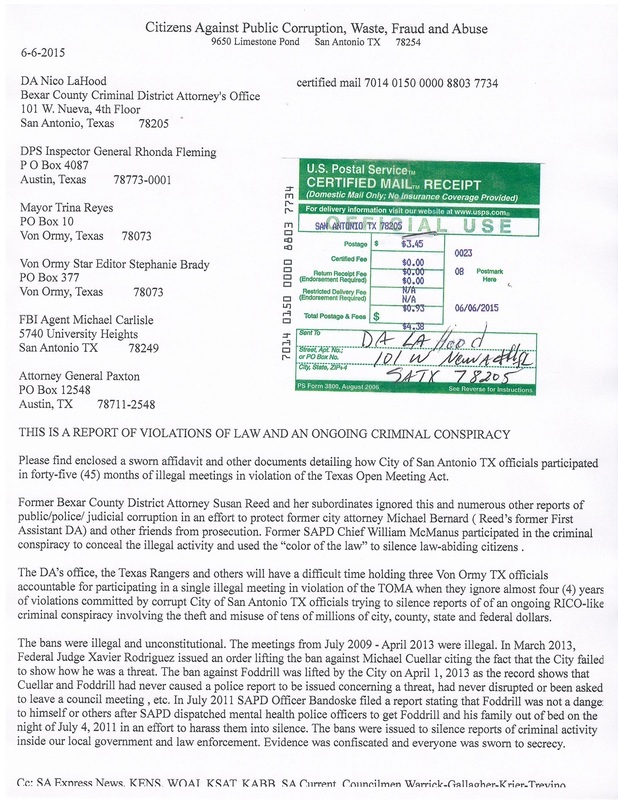 ...DA Nico LaHood lied in an effort to conceal evidence and cover up the criminal activity for his friends. 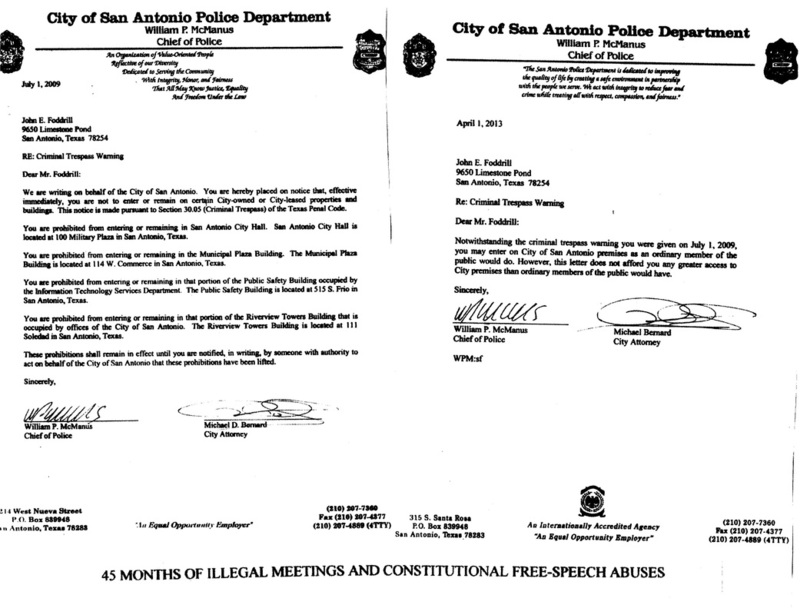 In June, 2015 DA LaHood, Texas Attorney General Paxton, DPS IG Fleming, FBI Agent Carlisle and others received correspondence, affidavits and documentation detailing almost four years of illegal city council meetings when San Antonio officials banned law-abiding whistleblowers to silence their reports of public/police corruption.....In typical South-Texas fashion nobody responded to the report stating "THIS IS A REPORT OF VIOLATIONS OF LAW"
In February 2016 US Attorney Durbin, FBI SAC Combs and AG Paxton were sent certified mail providing details of the criminal conspiracy by Bexar County DA LaHood to conceal almost four years of illegal meetings violating the texas Open Meeting Act / US Constitution, Judicial Fraud in the 57th District Court, theft and misuse of tens of millions of dollars, "cooked" books, HUD fraud, state/federal grant fraud , official oppression and other crimes.....we received no reply . Federal Judge Hansen stopped the fraud upon his court and held DOJ attorneys accountable for the perjury..we aasked for his assistance in exposing the fraud upon our 57th District Court and Federal Court...We received no reply. 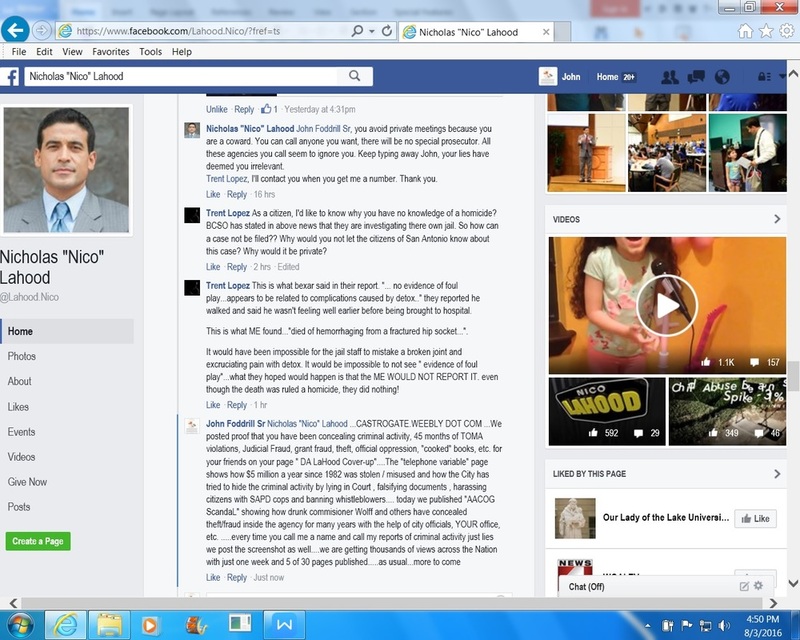 This FB screenshot shows DA LaHood calling the City's former Telecommunications Manager " FRAUD-rill" , a liar, a coward and a fraud. LaHood denies having 5 certified letters he received in 2015 . 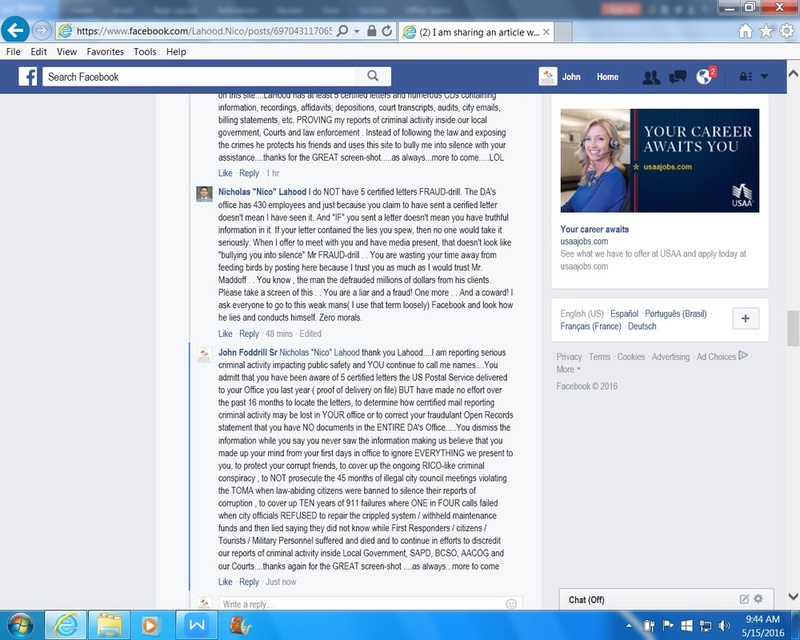 Screen-shots of LaHood’s public FB page show LaHood and his cronies bulling the City’s former Telecommunications Manager and calling him worthless, a liar, a political hack, the Foddrill type, insignificant, a troll ,a coward , “FRAUD-rill” and other names in an effort to discredit reports of the public / police corruption. Here his cronies make vulgar attacks that LaHood applauds. 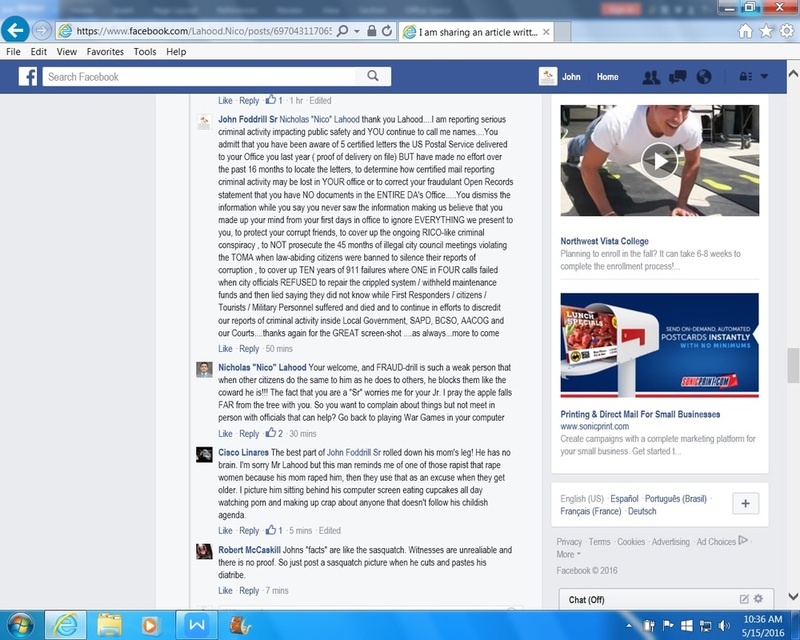 LaHood attacks the son of the whistleblower as well. 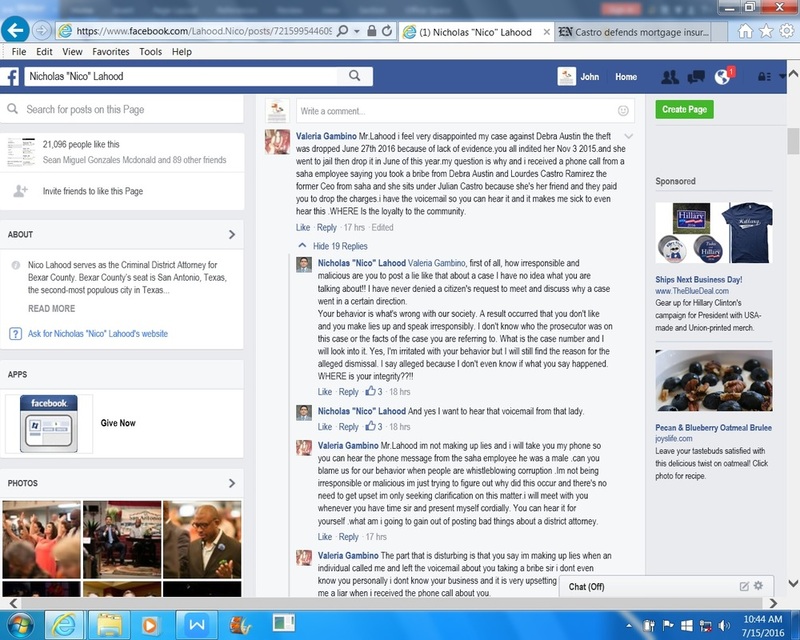 This FB screenshot shows a citizen reporting the fact that she received a voice message indicating that DA LaHood accepted a bribe from San Antonio Housing Authority - SAHA employees to drop a criminal case and that HUD Deputy Secretary Lourdes Castro Ramirez and others orchestrated retaliatory attacks against her. The HUD IG was contacted concerning these allegations of criminal behavior. The info and voice recording was posted on https://www.facebook.com/Jefsr as well. A video documenting this event is posted below and is posted on-line at https://youtu.be/5__WvFq-tfM. I, John E. Foddrill Sr, personally spoke face to face with Senator Uresti on several occasions at which time I provided him with details of an ongoing criminal conspiracy involving Bexar County DA Nico LaHood , SAPD Chief McManus and other officials. 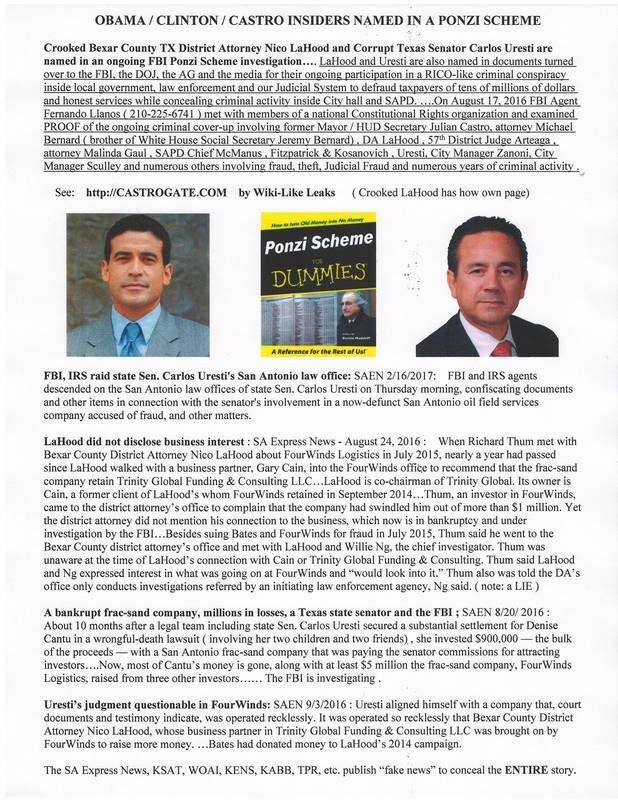 I was unaware of the business ties Uresti had to LaHood and Uresti never mentioned any such ties to me while I detailed criminal acts committed by LaHood to help conceal years of public / police corruption. I now understand why Uresti feigned interest but did nothing .